This three-hour training can help you make a difference. Most people with thoughts of suicide invite help. Often these opportunities are missed, dismissed or avoided – leaving people more alone and at greater risk. safeTALK training prepares you to help by using TALK (Tell, Ask, Listen and KeepSafe) to identify and engage people with thoughts of suicide and to connect them with further help and care. safeTALK is for everyone; front line workers, clergy, volunteers, parents, youth, teachers, law enforcement… and anyone who wants to help prevent suicide. 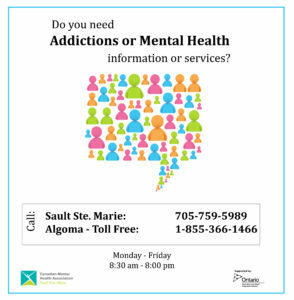 For more information or to register for the next course, please call Central Access & Information at 705-759-5989. Please click here to learn more about how to promote mental health in your workplace.